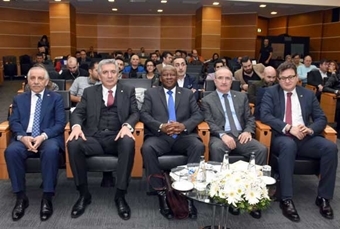 Istanbul Chamber of Industry (ICI) held a 'South Africa Country Day: Opportunities for Turkey' event to assess the cooperation and investment opportunities in South Africa, the most developed economy of the African continent. 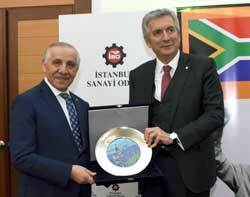 The event that was hosted by ICI Chairman Erdal Bahçıvan on 22 February 2018 in Odakule was honored by the attendance of South African Ambassador in Ankara Pule Isaac Malefane, South African Honorary Consul in Istanbul Remzi Gür, Turkish Ministry of Economy Pretoria Former Trade Consultant Hakan Karabalık and ICI Board Accounting Member Sadık Ayhan Saruhan. To the event that witnessed discussion regarding how to improve the economical relations between Turkey and South Africa throughout the day, a lot industrialists and business people had attended, too. In the opening speech of the event, ICI Chairman Erdal Bahçıvan mentioned the priority of improving political and economical relations with the African continent in the recent international economic strategy of Turkey. Bahçıvan stated that South Africa is therefore very important for Turkey as it is the gate way to Africa with a population of one billion. 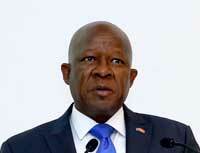 South African Ambassador in Ankara, Pule Isaac Malefane also made a speech. "The Republic of South Africa has a stable economy and it is open to Turkish investors. We believe that a 5 billion dollar trade volume will soon be possible between these two countries." said Malefane. 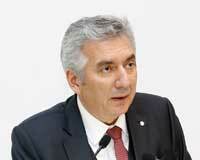 ICI Chairman Bahçıvan based the history of these relations to 1994 that the mutual embassies were opened. Bahçıvan reminded that there was commercial and cultural cooperation between two countries even before that date and there is still a meaningful interaction between them thanks to such mutual actions. Bahçıvan blamed the geographical distance for the relations to be not developed as desired. "There is a South African saying: 'The best time to plant a tree was 20 years ago, and the second best time is now.' We had laid a foundation more than 20 years ago. And now is the second best time to plant and grow the friendship and cooperation tree between two countries. It is up to us to use this opportunity wisely and to improve our relations further." said Bahçıvan. 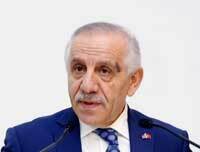 Attracting attention to another need, Bahçıvan reminded that there is still no free trade agreement between these two countries. Bahçıvan said that the attempts of the Turkish Ministry of Economy to sign such an agreement gives them hope, and underlined that the economical and commercial relations will gain a momentum once such a free trade agreement is signed between Turkey and South Africa. Naming South Africa as the most important trade partner of Turkey at the south of desert, Bahçıvan stated that the trade with the Republic of South Africa that has the largest economy of the respective region supplies almost 40 percent of the total trade with the countries at the south of the desert. "ICI contributes greatly to both the industry and the Turkish economy with its successful operations. 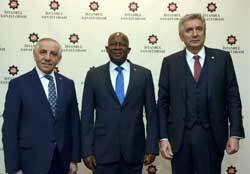 We appreciate the economical and social steps taken by Turkey for the development of Africa. The year 2017 had been declared as the Mandela year in the honor of Nelson Mandela. The efforts to improve economical relations with Turkey are carried out within this scope, too. South African economy is a stable economy. 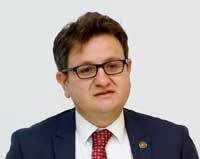 We invite Turkish investors for capital investment. We have a strong democracy and the superiority of law is guaranteed in our country. We believe that a 5 billion dollar trade volume will soon be possible between these two countries." said Malefane. After Bahçıvan, Honorary Consul of Republic of South Africa in Istanbul, Remzi Gür began his speech by stating that he is the honorary consul of South Africa for the past two years. Gür stated that this country that has rich underground sources is the country that is closest to the European culture in Africa, and once you enter into the South African market, you would have access to all in Africa since it has free trade agreements with its neighbor countries. Underlining that Turkey is closer to South Africa than Europe, he expresses his belief that Turkish entrepreneurs can do good in South Africa. Recording that he has no concerns regarding safety in South Africa, Gür invited Turkish investors to invest in South Africa and to establish partnerships in this country. Then, a panel titled 'Cooperation and Investment Opportunities in South Africa Market' was held. Turkish Ministry of Economy, Pretoria Former Trade Consultant Hakan Karabalık also talked during the panel. "The regional public is very close to us. South Africa has great opportunities for our companies. However, we need go and see it one the spot. There is a nice opportunity for business. 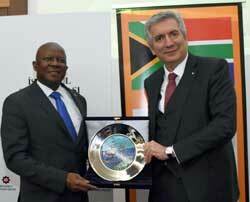 And it is possible to access other African markets through South Africa thanks to the Customs Union agreements. The country deals with both the huge income distribution gap and issues such as unemployment. Thus, one should consider the humane factors as much as economical ones while investing there." said Karabalık. Ankara South African Embassy's Trade and Investment Consultant Tsepho Ranamane made a presentation regarding South African economy and the overview of the country. And in the 'Experiences of Turkish Companies in South African Market' titled session moderated by ICI Vice Secretary General Mehmet Dolgan following this presentation, Koç Holding - Durable Consumer Products Group President Fatih Kemal Ebiçlioğlu and Repkon Machinery and Mold - Sales Director Ekrem Eriş and Repkon Machinery and Mold - Financial Affairs Director Mehmet Balaban shared their own experiences about South Africa and answered questions.